The Middle Park Conservation District is a political subdivision of the State of Colorado formed under the Colorado Soil Conservation Act of 1937. It is located high in the western slope of the Continental Divide at the headwaters of the Colorado River in Grand and Summit Counties. The average elevation is 8,000′ and above. The topography is characterized by rough, steep sloping mountains, gently sloping to rolling mesas, and valley bottoms dissected by numerous creeks and rivers. Most lands adjacent to these drainages are flood irrigated pastures and hay meadows, although some of those lands are succumbing to development. Middle Park, in its entirety, is approximately 1,592,000 acres in size (~1,196,000 in Grand and ~396,000 in Summit). 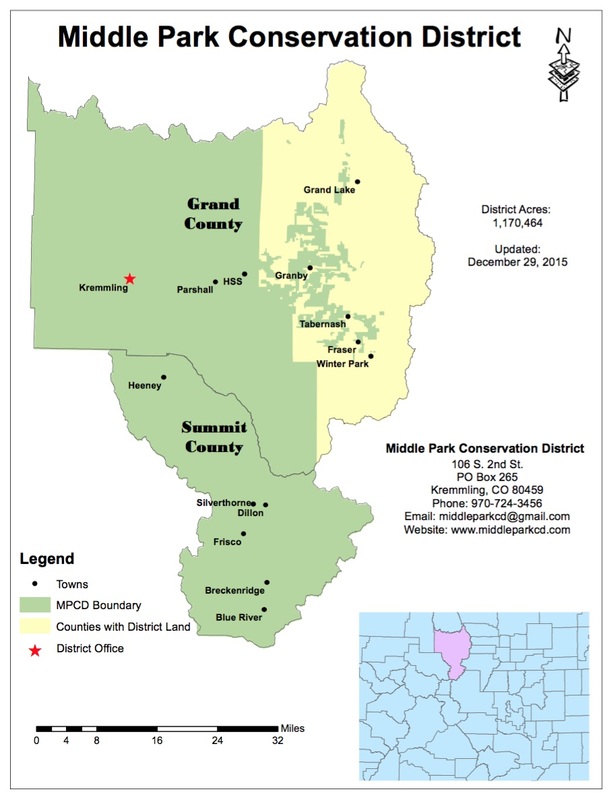 The MPCD boundaries include approximately 1,170,000 acres (~774,000 acres in Grand County and all of Summit County’s ~396,000 acres). According to 2017 estimated population figures by the US Census Bureau, about 15,321 people live in Grand County and about 30,585 live in Summit County. The Middle Park Conservation District promotes the conservation and wise use of land, soil, water, air, wildlife and related natural resources through education, program administration, and technical assistance for the benefit of all. We are committed to good land stewardship and sustainable use practices within Grand and Summit Counties. The Middle Park Conservation District will be a recognized and respected leader in the community by fostering natural resources conservation and cooperation among government officials, non-governmental groups, developers, community organizations and associations, land owners and the general public through education, technical assistance, and planning. The following summary is provided to you by the National Association of Conservation Districts (http://www.nacdnet.org/about/districts/history). 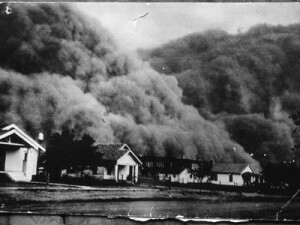 “In the early 1930s, along with the greatest depression this nation ever experienced, came an equally unparalleled ecological disaster known as the Dust Bowl. Following a severe and sustained drought in the Great Plains, the region’s soil began to erode and blow away, creating huge black dust storms that blotted out the sun and swallowed the countryside. Thousands of “dust refugees” left the black fog to seek better lives. 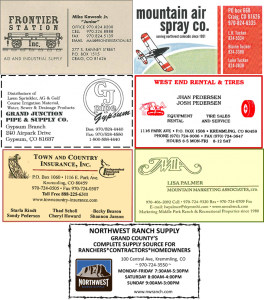 The Middle Park Conservation District (MPCD) was formed by a group of ranchers from Grand and Summit County initially met at Jerry’s Cafe on February 9, 1956, to discuss the formation of a soil conservation district. Then, on August 12, 1957, the certification of organization was issued by the Secretary of State and was recorded with the County Clerk and Recorder ​of both Grand and Summit counties. Since then, our focus has expanded to include smaller landowners who may not be ag producers. The District is under the operation of a locally elected Board of Supervisors and is required to obey the regulations of the Colorado Soil Conservation Act. It employs one District Manager/Executive Director and one District Conservation Technician (DCT). The District’s funding comes from the state Direct Assistance Fund, as well as the sale of grass seed, tree seedlings, tire tanks, and polyacrylamide.